Salmon is a very versatile fish that lends itself to many different preparations but is flavorful enough to be enjoyed on its own with just a squeeze of lemon. 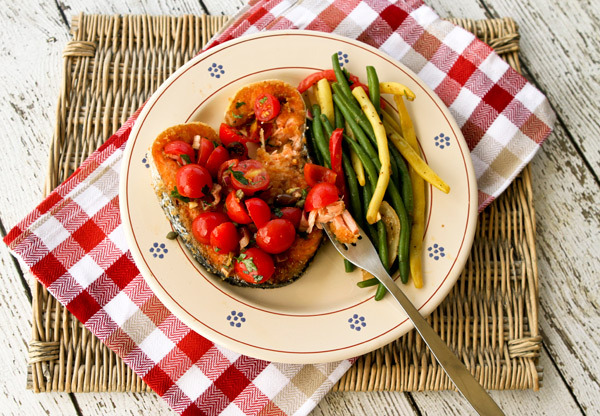 As well as being delicious tasting, wild salmon is extremely good for you as well. Salmon is a good source of protein that is high in Omega 3 fatty acids, essential amino acids, as well as being a good source of vitamins A, B6, E, D, & B and such minerals as calcium, magnesium, iron, zinc, and phosphorus. There is always a lot of debate at whether wild salmon is better for you than farmed salmon, and new research shows that farmed Atlantic salmon often contain at least as many omega-3s as wild salmon because they’re raised on a diet of other omega-3-rich fish. Here in Italy, salmon fillets are almost impossible to find and all I can usually buy at my fish mongers are salmon steaks. 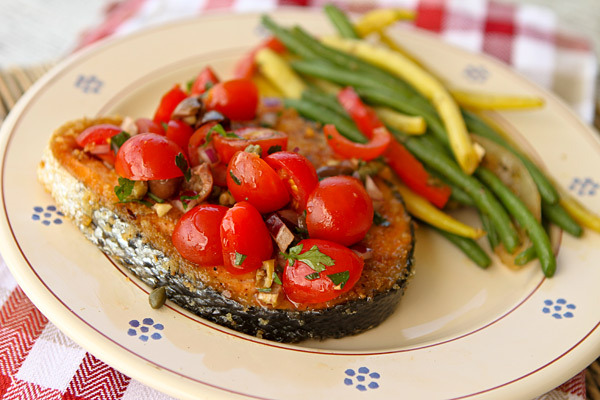 This recipe will work equally well with both salmon steaks and salmon fillets, so use whatever you prefer. When properly cooked, salmon is mild tasting, moist and flaky in texture. It is in fact better to have salmon a little underdone rather than fully cooked to ensure it remains moist. One of my favorite methods for cooking fish fillets is to lightly bread them, sear them on one side in a frying pan, then finish cooking them in a very hot oven. 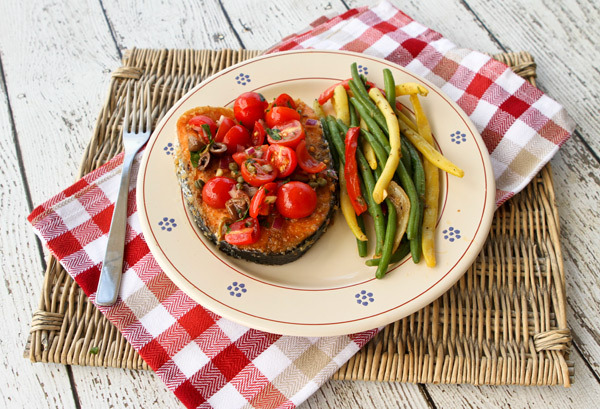 The high content of omega-3 fatty acids is what makes salmon a nutrition power food. Salmon is low in saturated fat and calories but high in protein. Rub the salmon with 2 tablespoons olive oil, then season with salt and pepper. Place the breadcrumbs in a shallow bowl, then dredge the fillets in the crumbs, using your fingertips to help the crumbs adhere to the fish. Refrigerate salmon fillets until ready to use. In an oven-proof frying pan, heat the remaining olive oil over medium high heat until lightly smoking, then place the breaded slam steaks in the pan. Sear the steaks until golden brown on one side, then carefully turn over and place the pan in the preheated oven. Cook the until medium, about 6 minutes. Serve the steaks topped with a large spoonful of the tomato relish.